In beating the New York Times to the punch covering the Bloomberg administration’s admissions about the city’s failed outsourcing policy, an about-face in that came in response to the CityTime scandal, Noticing New York presented a very different and much bigger big picture story than did the Times Sunday. - - Missed in being so Johnny-on-the-spot was the opportunity to incorporate observations by Atlantic Yards Report today about how the Times story buttressing a key point of that Noticing New York coverage: That the ill-fated trust the administration placed in delegations of government duties to the private sector carries over into its failures with respect to the management of the city’s mega-development projects. Atlantic Yards Report (Monday, March 28, 2011, Behind the Bloomberg administration's CityTime scandal: budget director Mark Page (who helped steer the revision of Forest City Ratner's MTA deal)) connects a dot the Times article neglected to (Behind Troubled City Payroll Project, Lax Oversight and One Powerful Insider, by David W. Chen, Serge F. Kovaleski and John Eligon, March 27, 2011). . .
. . . Atlantic Yards Report points out that the “drive to install the” [disastrously outsourced CityTime] “system could be traced to the determination of one powerful administration insider: the budget director, Mark Page” (Times quote) “one of the two Bloomberg appointees on the board of the Metropolitan Transportation Authority who pushed hard against any skepticism” (AYR quote) for the continued uncontrolled outsourcing of the Atlantic Yards megadevelopment (as a monopoly) to Forest City Ratner in June 2009 when that entailed a substantial revamping of the project without bid for the developer's benefit (and the public’s detriment). Yesterday’s Times story and the Noticing New York coverage from Sunday (which draws partly on prior New York Times coverage) are `apples and oranges' enough so that one cannot really say either is necessarily, per se, better than the other. But let's consider. Last week, Deputy Mayor Stephen Goldsmith declared what had become obvious: the city cannot rely on outside consultants to monitor multimillion-dollar technology contracts, which it had done with CityTime. He added that the city would create a new office inside City Hall to do so. An examination of the events that led to the CityTime scandal reveals lax oversight, mismanagement and a basic failure to control costs. The Noticing New York article spent some reviewing the flaws likely inherent in outsourcing of government responsibilities. What the Times article does do is furnish details about who saw or should have seen the CityTime disaster coming and how the ill-advised work proceeded at great expense anyway. The details for the story seem to have been furnished and fueled by some behind-the-scenes efforts at blame-trading even as the Bloomberg administration was publicly accepting responsibility with adult sobriety.
. . . that a fraud involving a system to reliably monitor city employee attendance was perpetrated in part with the submission of false time sheets. Mr. Page, a lawyer, had little familiarity with technology, but he believed CityTime would curb timekeeping abuses and save the city tens of millions annually. The industry standard for payroll or other automated projects is typically a cost per user of $200 to $1,000. By contrast, CityTime’s cost per user is roughly $4,000. New York State, for example, is spending only $217 million to modernize its finance and accounting systems — a far more ambitious project — that will be used by 200,000 people. We learn that Thompson did not “audit CityTime, despite a crescendo of grumblings” but conversely (according to one of his former high-ranking aides) “the comptroller’s office raised, on at least five occasions, concerns over costs in meetings with Mr. Page, as well as with others working for Mr. Bloomberg.” So does the quoted claim that Thompson was “asleep at the switch” hold up? The debate about Thompson vs. Bloomberg administration responsibility for shared responsibilities that went wrong is reminiscent of the Bloomberg/Thompson debates during the last campaign for mayor when they traded play-to-pay accusations about city pension fund investments previously covered by Noticing New York. Thompson’s defense meant that he and the mayor were pointing fingers at each other, each saying that the other either 1.) had the responsibility (all of the “buck”), or 2.) was at least supposed to be acting as a check against their own abuse. Could we really expect Bloomberg and Thompson to be a check and balance for each other when it came to the pension fund investments, or CityTime or Atlantic Yards? So much for the idea that the two men were a check and balance against each other. Perhaps Mayor Michael Bloomberg will actually be flying through the air tonight, “taking,” as the Times puts it, “a few free swings” at the notoriously mismanaged “Spiderman” musical, but such leaping stunts from Hilton balcony heights will be sharing headllines this week with stories about Bloomberg’s own mismanagement on the job. Let’s start first with this reminder: When Bloomberg was campaigning to change the city charter so that hizzoner could be specially bestowed a unique third term, Noticing New York furnished articles debunking Bloomberg’s claim that he, in fact, had the self-purported unique financial expertise making it essential he remain in office through the financial crisis. (See: Friday, October 24, 2008, Bloomberg Qualified Financial Crisis Leader? He Can Learn Says Schumer!, Saturday, October 25, 2008, More Discredit of Bloomberg as Qualified Financial Crisis Leader. Beyond that third-term-garnering canard, the promoted myth has always been that Bloomberg is administratively an exceptionally good mayor of the city because he comes from the business world and is therefore equipped with superior proven talents. But is that really that case? To ask the question is not to say that Bloomberg is a poor manager or that he, with his team, isn’t a reasonably good one. The fair question to ask is whether he is as good as he promotes himself to be. Ms. Harris’ paramount role in Bloomberg’s life, whether she has been pay-checked on the private-sector or City Hall government side, is as his top political adviser and strategist. Hired before Bloomberg announced his interest in politics Harris, with her previous City Hall experience under Koch, was key to Bloomberg’s first run for mayor wherein he successfully captured that office. Ergo, we might note that in Harris, like new Deputy Mayor of Operations Goldsmith, Bloomberg has hired someone capable of advising him on the pursuit of the next political office he might have his eye on. Based on Bloomberg’s pre-government curriculum vitae the expertise we could expect Bloomberg might have brought to government, besides general private sector management expertise, would be salesmanship expertise. Perhaps, more specifically, like Cathie Black, the woman Bloomberg recently hired as Schools Chancellor for her private sector expertise, media-company salesmanship expertise. The other kind of expertise we might expect from Bloomberg’s CV (and we will get back to this in a moment) is computer systems development expertise. Colleagues, however, sometimes wondered whether Black’s energies were devoted to promoting her magazines or herself. “She would be in her office all day, and much of her time was spent writing notes: ‘Dear Dr. Kissinger, what a pleasure it was to sit next to you at dinner last night,’?” remembers an advertising associate. One guest, a longtime colleague of Black’s, was reminded of a different setting. “I remember going into her home library, and it’s all these books: Swim With the Sharks Without Being Eaten Alive, What They Don’t Teach You at Harvard Business School. All these self-help business books, hundreds of them: ‘How to do the direct eye contact,’ ‘How to learn how to shake a hand,’ ‘How to learn to tell people you’re listening.’ All these tricks!” She was less of a superstar manager, in this view, than a gifted saleswoman of magazine ads—and herself. The core of the Bloomberg, L.P. business, the success from which it was all built, is the computer system that was put together to deliver financial data that became the Bloomberg terminal business (presenting huge conflict of interest with Bloomberg’s role as mayor) and then ultimately the larger (perhaps itself money-losing) Bloomberg media empire. One might therefore presuppose that Bloomberg knows how to manage the development of sophisticated and complex computer systems. Does he? One place where Bloomberg promotes his 311 system accomplishment is on his self-adulatory MikeBloomberg.com, a site almost too ludicrous to be believed and which we will have to spend a moment considering. 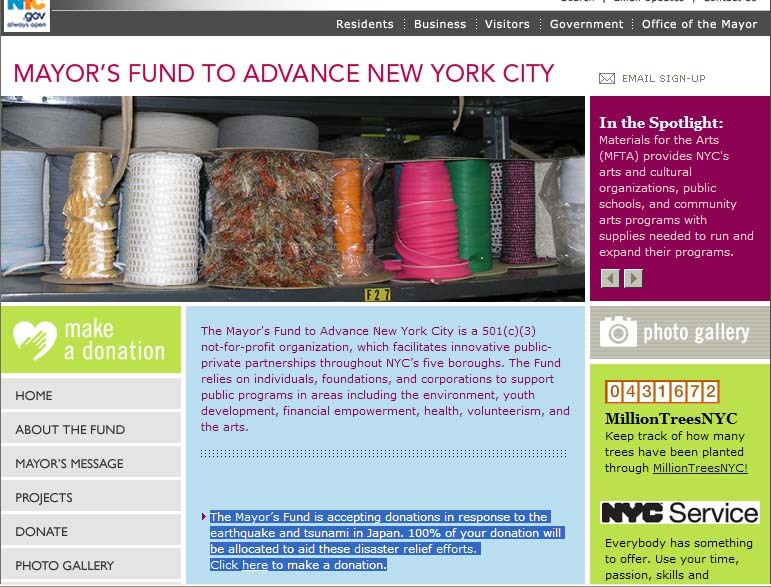 The site devotes a page with links to how the 311 system won a Digital Government Achievement Award in 2010. 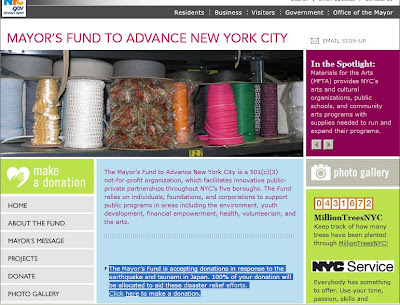 That particular page is bylined “NYC.gov,” whatever that means. Which brings us to the our next point for consideration. 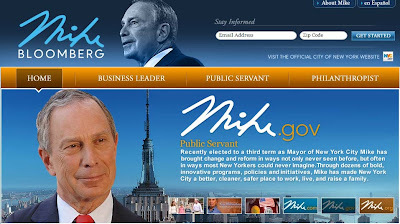 Though it is in fact only one url site, MikeBloomberg.com is set up to look as if Bloomberg has multiple operative sites: “Mike.com” representing Mike as a businessman, “Mike.org” representing Mike as a philanthropist, and “Mike.gov” representing Mike as public servant (i.e. mayor). Up top there are buttons that bring up a separately masthead design for each of Mike’s purported incarnations. In so doing, Bloomberg actively glories in what makes many of us very uncomfortable, that Bloomberg is wearing too many hats and that there are insufficient protections to keep these roles safely separate. As per prior Noticing New York coverage the concept of Bloomberg as philanthropist needs to be carefully examined. The mastheads just mentioned are so precious I am producing them below ad seriatim, preserved for posterity. On a roll, Bloomberg actually has six buttons producing various mastheads. The other three are: “Independence” (essentially a stand-in for the "No-Labels" party Bloomberg likely wants to run on and may have bankrolled to start), “One of 2010's top philanthropists” (that makes two philanthropy mastheads, and an OpEd praising labor with a steel union hard hat. OpEd praising labor, with a ironworkers union hard hat. This is not to mention the Run Mike Run site already actively promoting a Bloomberg run for president. The 311 system is a commendable achievement but if you think about it, given the rapid advances in computers that had occurred by the time Bloomberg took office (January 1, 2002) it was a computer system whose time had inevitably come. In 1999, Chicago created a “311” call center, which takes citizen complaints and refers them to the appropriate department for resolution. As the above article indicates the cutting edge matter to consider in this area is not now whether these 311 systems are widely spread throughout the country, but that the cities using them, (including New York) have not been advancing their development for the full range of capabilities that are possible. Is Mike Good With Computer System Development? casting a pall over an initiative that the mayor had championed as a hallmark of efficient, computerized management, the case does little to help the opinion of the administration’s outsourcing practices. Mark Mazer, a consultant, orchestrated the scheme, which got under way in 2005. He awarded contracts to people he had ties to, and took nearly $25 million in kickbacks, prosecutors said. Mr. Mazer, his colleague Scott Berger and the men whose companies he directed business toward, Dmitry Aronshtein and Victor Natanzon, were charged with filing fraudulent time sheets for consulting work. Mr. Mazer’s wife, Svetlana, and his mother, Larisa Medzon, were also arrested, accused of money laundering by funneling the kickbacks through a series of shell companies. It is ironic that a fraud involving a system to reliably monitor city employee attendance was perpetrated in part with the submission of false time sheets. The indictment raises questions of the city’s oversight of the CityTime project, and how the Office of Payroll Administration lost control of the project under the office’s executive director, Joel Bondy. Mr. Bondy has been suspended without pay by Mayor Michael R. Bloomberg and Comptroller John C. Liu. Although he was a subcontractor, Mr. Mazer held an informal position of authority in the city’s payroll administration office, with . . . the power to shape and approve contracts and work orders, the authorities said. Some city officials had huge concerns as far back as 2003 about the integrity of the project, whose costs have ballooned by hundreds of millions of dollars. In a scathing letter made available in December 2010 through a state Freedom of Information Law request, the city official in charge of overseeing the project, known as CityTime, accused the company that designed CityTime, SAIC, of repeatedly delaying the project in order to get paid more, failing to hew to basic industry standards and rewriting contracts on its own. The official even predicted, sarcastically, that SAIC would try, in a year’s time, to charge the city “8,000 hours” for shoddy work. The letter, dated Feb. 19, 2003, offers a devastating critique of the company, and raises questions about the city monitors of the project — the mayor’s and comptroller’s offices. And the consultants hired to ensure quality control, it appears, were doing very little of it. I have concluded that much of the solution lies not in more outsourcing to the private sector, but rather in employing city workers to perform more of our IT work. So in the weeks and months ahead, we will decisively shift more work from consultants outside government to our talented public employees. This will save taxpayers millions of dollars a year. And we are going to start challenging all components of technology contracts, and ensure that the city does not pay a markup to a consultant for work we could just as well do internally. Insourcing the management of projects and important decisions about scope and cost will allow us to save taxpayer dollars, enhance service delivery and ensure that IT vendor resources throughout the city are delivering on time and on-budget for New Yorkers. I think the bigger problem is they become the City. Right? We lose control of the scope and we lose control of the price and we need to bring more of the management on our side of the table. Union leaders are praising the decision. District Council 37 president Lillian Roberts calls it a "beginning." The same night, WNYC’s Bob Hennelly reported on his interview with Goldsmith on the subject in its Financial 411 noting that the CityTime payroll program was supposed to cost $63 million but ballooned to more than $700 million: Financial 411: Insourcing Vs. Outsourcing, Thursday, March 24, 2011. What happened here is that, you know, the department of information telecommunications and technology was only founded in 1994. That’s not a long time in terms of these huge contracts so just in the last few years it really has gotten to the place where it has technological capabilities inside the city workforce that can, indeed, ride herd on these outside contractors. I am not sure that is exactly true. Back in the 70's a close friend of mine was involved in setting up the city’s computerized “Integrated Financial Management System” (IFMS- pronounced “IFF-Muss”) which was a fairly sophisticated computerized system designed to restore management controls after the state and city fiscal crisis. In theory this “mastermind of the City of New York” . . “that makes Hal, the computer in the film ''2001: A Space Odyssey'' look like a pocket calculator” should have supplied Bloomberg and cohorts with resources to avoid the rampant out-of-control fraud of the CityTime scandal. Do you want to know what was most on my Noticing New York mind the entire time I was considering all this information about the ill-advised course taken with the Bloomberg administration’s outsourcing of these sophisticated and technically complex projects? It’s the penchant of the Bloomberg administration to do essentially the same thing when, by policy, it hands over large swaths of the city like Atlantic Yards, Willets Point, Columbia's West Harlem takeover, and Hudson Yards, to private developers (or paves the way for the leveling of Coney Island), essentially subcontracting the public’s warfare to those developers and just hoping for the best. It is the same thing: Government walking away from the job that only government can really do well. Surely, with these subcontracted handouts to the private sector, the public similarly loses money, but this time billions instead of hundreds of millions. Similarly, just as Deputy Mayor Goldsmith says: “the bigger problem is they become the City. Right? We lose control of the scope and we lose control of the price and we need to bring more of the management on our side of the table.” And if this loss of control doesn’t lead to what is technically “fraud” it leads to essentially the same kind of losses for the public as the unleashed developers ultimately deliver mega-messes that differ significantly in quality, scope, and nature from what they promised on day one. Thursday night American Public Media’s Marketplace ran a story that told of how the American Jobs Creation Act passed by Congress seven years ago didn’t create jobs. On the theory that it was inducing corporations to bring home foreign profits to create jobs the act created a window of time during which taxes on those profits were greatly reduced. C. Fritz Foley teaches finance at Harvard. He found more than half of every repatriated dollar went to something other than job creation. C. Fritz Foley: The funds were used to pay dividends to shareholders, and to repurchase shares. Economist Allen Sinai heads the research firm, Decision Economics. He says back in 2004, companies weren't punished if they didn't use their repatriated profits to create jobs. . . . .
Allen Sinai: They can set conditions, set an accountability mechanism, which says you get this money only if you hire people. The website is WinAmerica (the url contains “winamericacampiagn”) and here is what you read as soon as you get there (emphasis supplied). We have an opportunity right now to strengthen our economy, pay down our debt, put people back to work, and invest up to $1 trillion in America. Providing American businesses with incentives to invest at home is a common sense solution that will immediately inject up to $1 trillion into our economy and provide businesses with the certainty they need to help get Americans back to work. The time to act is now. Let’s invest the money here at home – not spend it there. The companies pushing for another tax break say that's true. [What Havard’s C. Fritz Foley said about how the corporations used the `repatriated’ monies to pay dividends to shareholders, and to repurchase shares.] But they say the money still made its way into the U.S. economy. Shareholders reinvested the dividends or spent the money. The Marketplace story can be found here: Companies press to repatriate overseas profits, by Nancy Marshall Genzer, Thursday, March 24, 2011. What is the fascination of this story for Noticing New York? It reminds us of the non-job-creating “job creation” programs we get that funnel money into real estate mega-developments like- oh, why bother with any other example- Ratner’s Atlantic Yards mega-monopoly. Basically the same thing is true: Why should we ever expect that these programs would ever be effective at creating jobs when government isn’t on duty managing matters to ensure the programs are being run for that purpose. And when government isn’t, the programs become just about the developer's lining their pockets at public expense. In the case of Atlantic Yards we have two levels of AWOL government, each level with its own fictional job creation program that is not fulfilling its ostensible purpose: At the state level the ESDC (the “New York State Urban Development Corporation” doing business as the “New York State Urban Development Corporation”) does not monitor or pay attention to how many jobs are created at the megadevelopment and on the federal level (Congress again neglecting the declared core of a program) we have the non-job-creating EB5 program that we will get to in a minute. Perhaps what mightily facilitates the ease with which the EB-5 program is abused is that it is not known by any formal title, like the American Jobs Creation Act, leaving the New York Times to struggle as it refers to Ratner’s `enrollment’ of “498 Asian investors” in “an obscure federal program that grants [“sells” is a better word] green cards in exchange for a $500,000 investment in a job-producing American project,” thereby stumbling compliantly into having referred to `job-production’ which is, as discussed, actually nonexistent. 1. ESDC doesn’t have a place to start from in tracking jobs, since all the job creation figures bandied about to promote the project were insanely phony to begin with. 2. ESDC doesn’t itself actively keep track of or monitor job creation. When stories surface about the number of jobs being created (or lack thereof) it is Forest City Ratner that is supplying the figures. 3. The actual jobs, to the extent that they can be detected, are much lower than (expected?- NO) originally bruited. Very low indeed. 4. Ratner is doing what he can to keep employment resulting from the megadevelopment at a minimum, particularly union employment, including through the use of untested modular construction. 5. The role of government to monitor and administer its own job creation programs really oughtn’t be delegated by abdication as, for instance, to the CBA (so-called “Community Benefits Agreement”). Rather, to the extent that this is what ESDC did with Atlantic Yards, Forest City Ratner has actively gone out of its way to avoid hiring an Independent Compliance Monitor as called for by the CBA. 6. To the extent that any part of the provision of jobs is meant to be related to the provision of minority jobs, the responsibility for tracking that remains in the hands of someone Ratner hired, Darrle E. Greene, best known for being indicted for (and ultimately having to make restitution for) falsifying numbers he was submitting to government. When the disgraced Greene was found to be involved in the Aqueduct Raceway scandal (involving multiple parallels to Atlantic Yards) Greene was forced to withdraw from the Aqueduct transaction but he is still around for Atlantic Yards. Ratner must have thought, “Gee, the racket of getting credit for phony jobs is pretty good” (a little like the old joke about what a good business prostitution is- “you sell it, you still got it!” Or maybe it's like a four-year-old girl’s tea party with the pretend tea you can keep offering no matter how many Barbie or Winnie the Pooh guests show up- “Would you like some”- and then you pour the invisible liquid of which your imagination has an infinite supply). So Ratner figured he ought to branch out and diversify in the phony jobs business. Hence, the EB5 program where he gets to sell to the federal government the same non-job-creation he sold to ESDC, getting credit twice for the very same quite minimal, decreasing and mostly phantom jobs. What’s lost in all this nonsense when honest government has strolled off the beat is that this vast capacity for delusional benefits is displacing real economic activity that would have a much better chance of creating jobs. Why is this important? Because Mr. Cuomo is the decision maker to who controls ESDC (the “New York State Urban Development Corporation” doing business as the “New York State Urban Development Corporation”) and could thereby, with relatively little difficulty, pull the plug on Bruce Ratner’s Atlantic Yards Mega-monopoly to send Mr. Ratner packing. He should. Although it is potentially pertinent background, it should not be thought that Mr. Ratner is proposing to build in the footsteps of Mr. Cuomo. Mr. Cuomo was never building the sort of tall buildings or high-density project that Mr. Ratner is talking about and he did not push the envelope beyond tested technology as Mr. Ratner proposes to do. Mr. Cuomo promised high quality cost effective design (donated by contributing architects), he did not engage in a bait-and-switcheroo that started with a promise of premium starchitecture via the likes of Frank Gehry. Nevertheless, there are those who are likely to remember, recalling the issues of the day. The unions are likely to remember. Mr. Cuomo is likely to remember. And who knows what those who may be talking to Governor Cuomo may be saying to him about this, perhaps thinking that the rest of us don’t remember. One of the issues that came up back then, an issue you can only get with modular construction, is whether the modular units might be built out of state. Heck, with modular construction you could build in Canada! But, back then, not even the governor’s son was supposed to build out of state, not even to save money to house more of the homeless. The reasons given for the delay differ. Andrew Cuomo, who does not acknowledge a delay, said it has taken this long to line up the financing and iron out the legal questions over the title to the land. . . .
Others working on the project cited complications with local unions. The building-trades unions are balking, they said, because they object to using prefabricated units in the place of traditional construction. A number of people involved in the project said this week that although statewide union leaders had agreed, in principle, to using prefabricated units, local leaders and members do not. Workers elsewhere in the state would make the prefabricated parts, but local workers would lose on-site work. Some described the problem as an internal union dispute. Others agreed, but also said the project's sponsors, including Mr. Cuomo, had failed to anticipate the problem before announcing the plan. The project, the first stage of what is ultimately to be 10 shelters housing 2,000 families around the state, was seen as an innovative solution to the problems of the homeless, as well as a political solution, for the Mayor and the Governor. . . . . According to city officials, Mr. Cuomo and leaders of local unions exchanged harsh words at a meeting six weeks ago. Mr. Cuomo said he would not characterize the meeting that way, but would not be more specific. The city and state prefer using the prefabricated, or modular, units, because, the officials said, they would cost up to 20 percent less than conventional buildings and would save as much as five months in building time. Mr. Cuomo described the debate over the construction methods as a long-running one between the city and the unions. In a subsequent interview, he acknowledged that if conventional construction were used, the project would take more time. ''It has not been the cause for delay up front, but it would delay it at the back end,'' he said. It remains unclear when construction on the shelter could begin or how long it would take. . . . . The timetable depends on the construction method. If it is prefabricated units, he said, the shelter could be completed by next spring or early summer. A note of disclosure: I was the attorney in charge of working on these H.E.L.P. projects with Mr. Cuomo at the New York State Housing Finance Agency which provided financing. Monday, Atlantic Yards Report reported on a question I asked about the cognitive dissonance of the New York Times coverage of Atlantic Yards, at a debate last month sponsored by the Manhattan Institute for Policy Research. The debate was essentially a promotion for the book “Gray Lady Down” by William McGowan. The debate, moderated by Fred Siegel and hosted at St. Francis College in Brooklyn Heights was between author McGowan and Michael Tomasky, Editor of Democracy Journal and American Editor-at-Large, Guardian. Some Valuable Ideas from the Manhattan Institute. . . The conservative-leaning Manhattan Institute can be a source of exceedingly valuable ideas, particularly in pointing out government interventions in the natural operations of the economy that wind up proving the law of unintended consequences. For instance, Peter D. Salins, a senior fellow with the institute, was a professor of mine at Hunter Urban Planning school (and also Dean of the school at the time) and is a thinker for whom I have particular fondness. I especially recommend an elegant if physically slim little volume (and now hard to find) he wrote about the decline of the Bronx: The Ecology of Housing Destruction (NYU Press, February 1980). Salins is not a fan of housing subsidies. Based on what I know of his work, I predict that Salins would side with urban planner and author Alex Garvin (whose ideas were recently selectively popular in the Bloomberg Administration) in saying that if you want more affordable housing the better way for government to promote it is to invest in infrastructure that opens up a wider range of building opportunities for developers. In other words: `development-oriented transit’ is preferable to that which the Bloomberg administration is doing too much of- `transit-oriented development’ (e.g. Atlantic Yards). Intending the Consequence of Improper Public Official Conduct? One might say that Atlantic Yards itself is an example of the law of unintended consequences especially if one conceives that the law extends to government officials dishonestly conniving with a politically connected developer to abuse public programs. But, as powerful as the law of unintended consequences, may be, Atlantic Yards is not a true test of whether many of the programs involved in supporting the megadevelopment could actually work because public officials are not administering those programs as they were intended to be administered. The absence of bids is one thing, and then no one involved actually honestly believes that there was any blight at the site, although a blight-removing public program was invoked as a government tool to remove Ratner’s competitors from the vicinity of his other properties. If the law of unintended consequences doesn’t already encompass it, then there should be another close cousin to that law: The law of unintended (or undesired) public official dishonesty. Consideration of whether or not the myriad public subsidy programs that Salins criticizes are inherently flawed or might, if they were properly run, achieve some admirable objectives ought to be tempered with another concern: Whether these programs are also inherently dangerous to the public given that they are so readily susceptible to being hijacked by “rent seeking” developers whose goals are to redirect subsidies intended to benefit the public to into their own pocket instead. Where does Noticing New York stand on the political spectrum? Noticing New York attempts to apply both conservative and liberal tests of what good government should be. They overlap a great deal more than is generally acknowledged. Conservatives may fear big government and liberals may fear big business, but these days the preeminent problem both should unite to oppose is the collusion of big government to give big business the edge. Surely, the Manhattan Institute has good work to do and surely a careful examination of the Times is an important undertaking. No matter what, the evening would have been valuably thought provoking, but whereas Salins' work is regularly on target much of the evening’s critique of the Times seemed like superfluous quibbling, off-target and not up to the best of what the Manhattan Institute has to offer. The Times is having a harder and harder time not covering Atlantic Yards. That’s partly because Atlantic Yards is a bigger story than the paper has heretofore rightfully acknowledged. Basically, I think there was a decision at the Times made, albeit in the necessarily amorphous and unstated way that decisions would have to be made in such a news organization, to relegate Atlantic Yards, and more specifically the governmental misconduct and impermissible cronyism associated with Atlantic Yards, to the status of an official non-story within its pages. But the story won’t go away. With new revelations like the Forest City Ratner pattern of being involved in the bribery of government officials, the recently unveiled ambition to make Atlantic Yards the densest forest of modular units in North America and EB5 program abuses in selling green cards to the Chinese solely for developer benefit the Atlantic Yards saga is a constant poster child for malefaction. But what the Times most misestimates is the extent to which the Times story interrelates with the coverage of the national and local stories it editorially believes it should be covering vigilantly. The Times can’t write about race relations without observing the context in which white men like Ratner have attempted manipulate those concerns for their own financial advantage. The Times can’t cover Bloomberg and his potential run for president without observing how he favors awarding the development of big swaths of the city to a small in-crowd of connected developers. The Wall Street shenanigans covered by the Times very popular op-ed columnist Paul Krugman echo in the goings on with respect to Atlantic Yards as do all the Times stories about the accelerating redistributions of wealth from the middle class to the upper echelons. The list of what the Times is missing by failing to make connections goes on ad infinitum. It also all relates to the question asked by the title given to the St. Francis evening debate: “Is the New York Times Good for Democracy?” The Times seriously hamstrings itself with respect to covering the big story on American Democracy by failing to adequately cover Atlantic Yards. The proposed Nets arena is just a small part of the master plan, the most expensive Urban Renewal and property condemnation in Brooklyn’s history. Only The Brooklyn Papers has asked: Is this the Manhattanization of Brooklyn ... or the “depeopling” suburbanization of our streets? Are these projects good for Brooklyn? 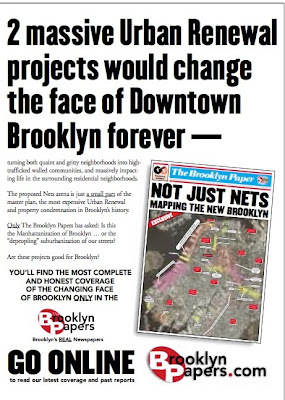 YOU'LL FIND THE MOST COMPLETE AND HONEST COVERAGE OF THE CHANGING FACE OF BROOKLYN ONLY IN THE BrooklynPapers. Atlantic Yards is still the biggest story in Brooklyn but since the Brooklyn Paper was acquired by Murdoch (and Ratner became its landlord) it has been relegated to a non-story within that paper’s pages just as at the Times. 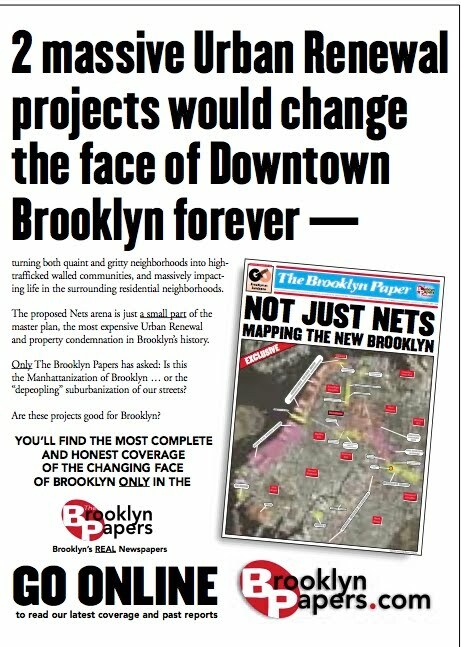 Atlantic Yards Report comments: “The Brooklyn Paper did an aggressive job covering Atlantic Yards, though that's diminished since” the paper was acquired by Murdoch. `Diminished’ is a severe understatement. Among other things it hasn’t covered the EB5 story concerning the sale of green cards to Chinese `investors.’ And the paper would certainly never now run a full page advertisement trumpeting its critical coverage of Ratner. I have no doubt that the editorial page is committed, by virtue of the "spirit of the Times" (aka Sulzberger), to supporting Atlantic Yards, or, at least, keeping its mouth shut about dismaying details. Is the Metro desk in the tank? I don't think so--and I can't let myself think so. But the Times has done, on the whole, a lousy job covering Atlantic Yards. The Times’ editorial page has always set and followed an agenda. The problem, some argue, is that its editorial viewpoint has bled over into the news reporting itself. Editors make choices, and the Times has chosen to put far less energy into looking carefully at Atlantic Yards than at a number of other issues. Meanwhile, the Sports section laps up Nets publicity. Bloomberg Muscles In On Earthquake and Tsunami in Japan With the “Mayors Fund to Advance the City”: Charity? We Groan Again! at 2:46 p.m. Tokyo time, on Friday, March 10. Hardly had the Japanese been struck information was appearing in the press (the Associated Press, Huffington Post, and, if you were listening, on WNYC, New York’s public radio station) that Bloomberg was soliciting to be the conduit vehicle, through the Mayors Fund to Advance the City, for sending money in aid to the Japanese! Great! That put Mr. Bloomberg immediately into the midst of one of the most Googled subjects from that point on. 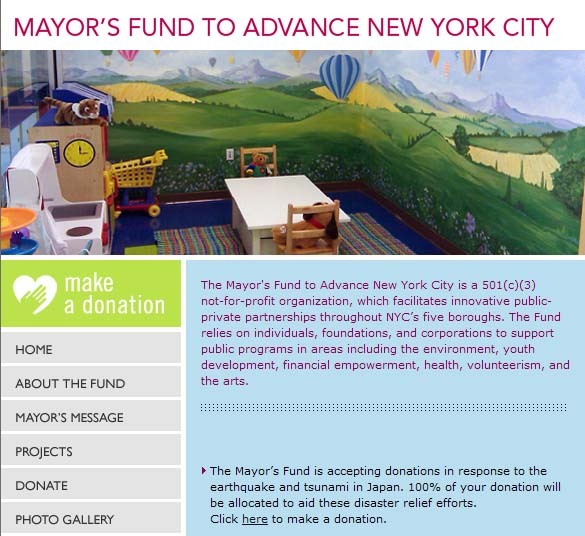 The Mayor’s Fund is accepting donations in response to the earthquake and tsunami in Japan. 100% of your donation will be allocated to aid these disaster relief efforts. Click here to make a donation. Below is an image of what you get if you click to donate. Even if the money Bloomberg induces people to donate with this gambit is not deployed with political strings attached as has reportedly been the case in Bloomberg’s distribution of other “charity” in the past, this looks like it is undoubtedly a political calculation. Here are links to other coverage. The comments are more interesting than the stories that simply repeat the information Bloomberg apparently disseminated press-release style to the press. Is Ratner really intending to carry out this most recently proposed bait-and-switch or is it just blackmail to get the state and city to give him more money? Does it make a difference? The result is the same; the public has been gypped. And thank you very much ESDC; this comes courtesy of you. The analysis of whether the public is being blackmailed essentially harkens back to the way that Ratner threatened Community Board 2 for additional approvals on his Beekman Tower project by saying he wouldn’t build the community’s promised school. He was already theoretically obligated to build the school in connection with the permission he had been given to erect such an immense building on the site. He got the benefit of the extra approvals from the community board. On today’s WNYC 411, Greg David has another take on the possibility that Ratner is bluffing, this time harkening back, also to the Beekman Tower, but this time to the way that Ratner later (bluffingly?) halted the tower's construction in order to exact concessions from the construction unions. The tower DID eventually proceed and Ratner DID get concession from the unions. The fact is we may both be right. If it is potentially a ploy Ratner may intend it do double duty and do both. Business reporter Mr. David appears to be having a harder time saying he still supports Ratner’s Atlantic Yards mega-monopoly, but he refused to say, when questioned during his interview, that he was wrong from the start. He offered a tempered and lukewarm hedged assessment: “Sure I regret that it’s not going to be beautiful off the bat, but you know fifteen years from now it might be great, - I’m hoping.” - - Fifteen years as hoped for by Mr. David is, of course, outside the 10-year time frame for which ESDC did its environmental assessment and the project is actually now expected to take decades. In the lightning-keeps-striking department, state officials over at ESDC* appear to have been embarrassingly stung by yet one more bait-and-switch by Atlantic Yards developer Bruce Ratner with his just-announced intention to convert the now erstwhile premium design he once promised for his Atlantic Yards mega-monopoly to a mere assembly of prefab modular units. Ratner would thereby be bestowing upon Brooklyn the world's tallest prefab building (with untested technology) and what is projected to be the densest 22-acres of residential units in North America would then become a super-tall forest of cheap prefabs. 1. Cheap, untested, modular construction instead of premium `starchitect' (Frank Gehry) design (or high quality materials) for the residential portions of the project. 2. The revamping of the basketball arena Gehry design to an airplane hanger design dressed up with a theoretically temporary metal lattice work wreath. That arena is also smaller than promised and apparently can’t accommodate a hockey team, not that the surrounding Brooklyn Brownstone community should actually be happy if it could. 3. A shift from a swift 10-year build-out of the megadevelopment to a schedule that (like the now 40-plus-year development of Roosevelt Island) will take the protraction of “decades” to complete. 4. Constructing, in return for the MTA’s contribution of land, a significantly downscaled train yard with 7 tracks rather than 9 or the original 10, which reduced and minimized train yard will not provide the MTA with the flexibility it needs for long-term plans. 5. A ditching of promised green space both in permanent and immediate terms. 6. A substantially lower, in fact pathetically paltry, purchase price for public land paid out over time and at the developer’s option rather than upfront. The developer also gets an artificially low interest rate courtesy of the taxpayers puts down just 20% to start and doesn't having to pay the bulk of the already discounted price the government had previously accepted, a remaining $80 million, until 2031. The list above is incomplete not only because it is virtually impossible to remember well enough to enumerate every single alteration of this project for the benefit of the developer at the expense of the public, but also because there are undoubtedly more bait-and-switches in store for us. Further, as ESDC often keeps bait-and-switches under wraps, there may actually be more in place at this moment. 7. Substitution of ethically questionable Russian oligarch Mikhail Prokhorov for familiar American investors. Beyond numerous other giveaways, like gifting the renaming rights of two major New York City subway station hubs for the developer to sell, we can probably also toss into this stew the way that New York State public officials have abased themselves by shilling for various developer tactics designed to divert more of the public’s tax dollars, including lobbying for the granting of a special IRS loophole's continuance to finance the arena and the use of EB5 sale of green cards to the Chinese via a program theoretically intended to increase jobs in the United States even while the developer, through maneuvers like this shifting to cheap modular construction, is hacking away at the already fictional number of jobs the project once promised. We could easily include such public official abasements for the developer’s sake but perhaps the willingness of ESDC officials to abase themselves this way is just something inherently in these officials’ DNA. . . they just naturally give things away for free. I am not surprised that the first thing a friend asked me upon hearing of this latest bait-and-switch was: “Do you think that Ratner intended this all along?” Whether Ratner intended this particular bait-and-switch all along is not the question. What is important, as we have pointed out before, is that ESDC worked from the beginning to put the Forest City Ratner organization in the driver's seat, giving it, without bid, exclusive rights to this megadevelopment in such a way that Ratner could always shortchange and blackmail the public with frequent bait-and-switches thereafter. This setup for bait-and-switches was certainly intended by Ratner and consciously facilitated by ESDC officials from the get-go. So whether or not Ratner intended this particular bait-and-switch is not important: He intended a framework in which he could pull off this bait-and-switch or any other bait-and-switch he could think of. Is it possible that Ratner is a man who can say something reassuring to your face even while intending exactly the opposite? If there was any doubt, this bait-and-switch addresses that question. Yes he can. From a Noticing New York viewpoint it is possible to have some sympathy for unions some of the time (see, Monday, February 28, 2011, Private Sector Croynism Seeks to Replace Government in Wisconsin: Might New York Be Leading the Way? ), but when it comes to the construction unions supporting Atlantic Yards and other mega-schemes in New York like the rezoning of Coney Island little sympathy should be extended to them. It has, of course, been noted that Ratner’s switch to modular construction leaves the unions high and dry, eliminating almost all of the promised jobs and replacing them with much cheaper low-cost and perhaps out-of-state jobs. Atlantic Yards Report has posted an article, complete with embedded video of Ratner saluting his union allies at the at the ceremonial groundbreaking for the Atlantic Yards arena (Thursday, March 17, 2011, At the March 2010 groundbreaking, Bruce Ratner saluted union labor, to cheers, thanking them for "arm in arm support for this project" (video)). That was March 10, 2010. On March 17, 2011 (St. Patrick’s Day), the front page New York Times story that informed us that Ratner was shafting the unions by going with modular construction also informed us that, “Mr. Ratner’s development company, Forest City Ratner, has been investigating modular construction for a year, but has kept its plans secret.” For a year! That sounds like two things were going on simultaneously, Ratner was praising the unions as his allies and secretly planning to shaft them. Where Now and Who's Watching? Where do we go from here? The state ESDC is now owned lock, stock and barrel by Andrew Cuomo now that he is governor. Everything that happens from here on in, every future bait-and-switch, is on his watch. If Cuomo wants to prove that the money he accepted from Forest City Ratner during his campaign for office didn’t mean anything he should terminate the project and take the land back from Ratner now. Similarly, Eric Schneiderman, our new New York State Attorney General who promised to investigate abuses of eminent domain like Atlantic Yards but took $12,500 from Forest City Ratner for his campaign should get busy investigating as he promised. With the Ratner organization being implicated in paying off public officials with respect to two of its biggest projects in both Brooklyn and Yonkers, he has plenty to investigate. Note that both Mr. Cuomo and Mr. Schneiderman should have a freer hand to act (without sacrificing any significant political capital) now that the Ratner plan to shaft the unions has seen the light of day. One thing that taking the project from Ratner and bidding it out to multiple developers (as at Battery Park City) could do is bring those jobs back into play and, with multiple developers. . . And the work would likely materialize far sooner. How Could Cuomo Give Ratner the Boot? One simple, efficacious way for Cuomo to send Ratner packing would be to simple settle the current environmental lawsuit before Judge Marcy Friedman in favor of the myriad community plaintiff organizations that joined together to bring it. In fact, looking at this switch to modular prefab, Atlantic Yards Report has just added one more reason why that lawsuit should be settled in the plaintiffs’ favor: See, Thursday, March 17, 2011, Does modular construction mean a new environmental review is needed for Atlantic Yards? Settling in the plaintiffs’ favor would give us all one dead Ratner project. It would also mean an end to the current structure that locks the state and city into being the victim of a constant round of bait-and-switch operations throughout the foreseeable decades. Your move, Governor Cuomo.